The Borderline trail is located in the Klonzo Mountain Biking Area north of Moab, Utah. The trail begins at Parking Area A and extends for 1.7 miles up a gentle grade to its junction with the Wahoo trail. Enroute the Borderline trail has connections with the Cross Canyon, Zoltar and Snippet trails. The ability to use the Borderline trail to get to the other trails in the North Klonzo section allows visitors to configure a variety of fun routes to hike, bike and run. The Borderline trail begins at Parking Area A. To get to the parking area drive about 12 miles north of Moab, or 18 miles south from the Crescent Junction exit of Interstate 70, and turn east on the Willow Springs Road. Follow the dirt road for about 2.7 miles paying attention to the signs that direct traffic to the Klonzo area. The road passes through a big sandy wash that might require a 4-wheel drive at times. If you have to stop in the wash it is easy to get stuck in the loose sand. Passenger cars can find a place to park before the wash and begin from there. The Borderline trail departs on the right from the trailhead. As the trail heads east it follows the contours along the base of the cliffs traveling in and out of shallow washes and over small ridges that it encounters along the way. After about 4 tenths of a mile or so the trail passes through Parking Area B. Just past the half mile point the lower end of the Cross Canyon trail junctions with the Borderline trail. As the trail continues east the grade has a slight increase to it. A glance at the trails profile shows that even with almost 400 feet of elevation gain that it is spread out so evenly over the length of the trail that it is barely noticeable. The profile makes the trail look steeper that it actually is or than it seems anyway. At the 1 mile point the Cross Canyon trail kisses the Borderline trail on the left and the Zoltar trail departs on the right where it crosses an expanse of broken slickrock and comes out on the Willow Springs Road at the point the Houdini and Red Hot trails begin. 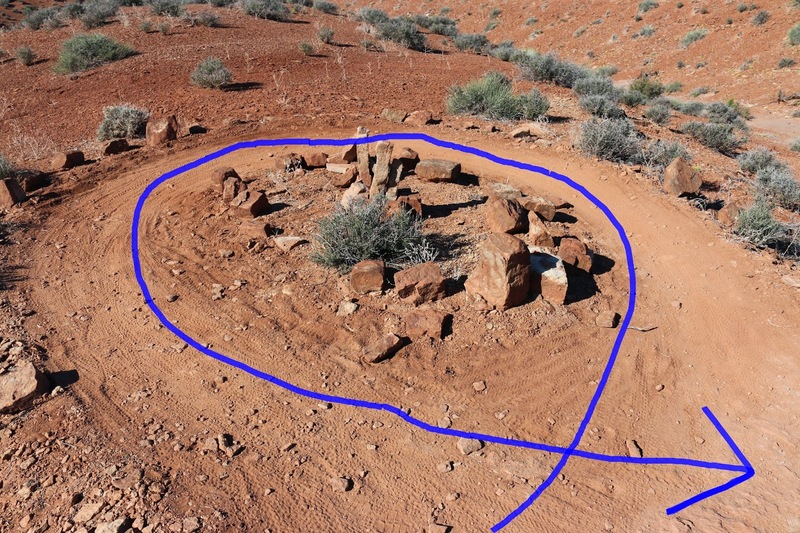 As the trail continues it comes to an ingenious little roundabout that is located at a sharp right turn. It takes a difficult situation and turns it into a fun and easy event. The Snippet trail makes its connection near the 1.3 mile point. The last stretch of the Borderline trail changes from a mostly dirt track to broken slickrock which lasts all the way up to the point it comes to an end at the Wahoo trail. From here we rode the Wahoo trail in the suggested counterclockwise direction and after completing that we re-rode a little more of the Wahoo trail to get to the beginning of the newly created Gravitron trail. Before the day was over we found ourselves riding up the first part of the Borderline trail once again to get to the Zoltar trail. So many trails, so much fun. For a great place to hit some trails check out the Klonzo area and the Borderline trail. If you would like to see it for yourself then all you have to do is grab your bike or 'Take a hike'.